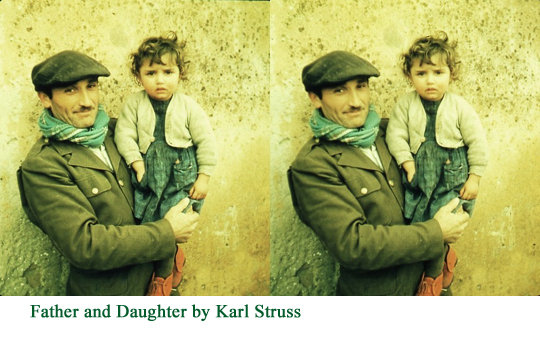 One of the most noteworthy members the Stereo Division of the Photographic Society of America (PSA) and the Stereo Club of Southern California (SCSC) has ever had is Karl Struss. Most famous as the first cameraman (along with Charles Rosher) to win an Academy Award for Best Cinematography for the 1927 film Sunrise, directed by F.W. Murnau, Struss's entire life was dedicated to the craft of photography. 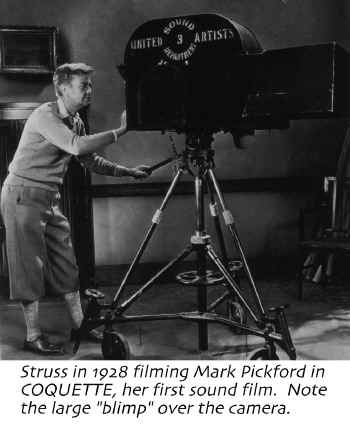 "Struss was by temperament a pictorialist, by instinct an illusionist and by accomplishment one of the great cameramen in the floridly creative quarter century of filmmaking that followed The Birth of a Nation (1915)," writes Scott Eyman in Five American Cinematographers (Scarecrow Press: 1987). Born in New York in 1886, Struss studied photography with Clarence H. White and was admitted to Alfred Stieglitz's "291" photo-pictorialist group in 1909. By 1914, Struss was an accomplished pictorial photographer with his own studio who was selling work to Vogue, Vanity Fair and Harper's Bazaar magazines. "It wasn't fashion photography," said Struss, "it was pictorial photography." Migrating as a still photographer to Hollywood in 1919, Struss signed on with Cecil B. DeMille as a second unit cameraman. Soon, he was filming Ben Hur (1925) with the early two-color Technicolor process and working with stars like Mary Pickford on Sparrows (1926) and Fredric March on Dr. Jekyll and Mr. Hyde (1932). 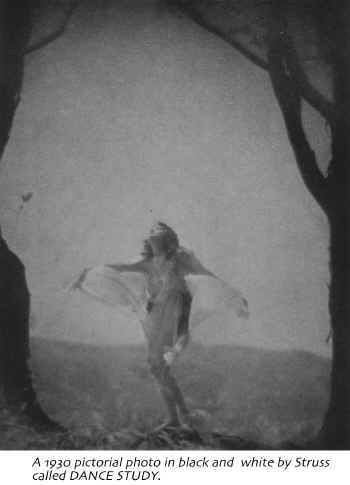 Struss produced masterful pictorialist photography with dissolves, soft lighting effects and double exposures on Sunrise (1927) and was at the top of his craft when Mary Pickford insisted he photograph her first sound film, Coquette, in 1928. Invited to join the American Society of Cinematographers and bear the distinguished letters "ASC" after his name in motion picture credits, Struss was equally at home with black-and-white or color cinematography. "Cinematography in present-day dramatic films is not an end, but a means to an end, whereas the still picture is often, if not always, both the means and the end itself," wrote Struss in a 1934 issue of American Cinematographer with an article titled "Photographic Modernism and the Cinematographer." From 1920 to 1959, Struss was the cinematographer on over 135 feature films. Notable collaborations for Struss included work with D.W. Griffith on Abraham Lincoln (1930) and Charlie Chaplin on The Great Dictator (1940) and Limelight (1952). 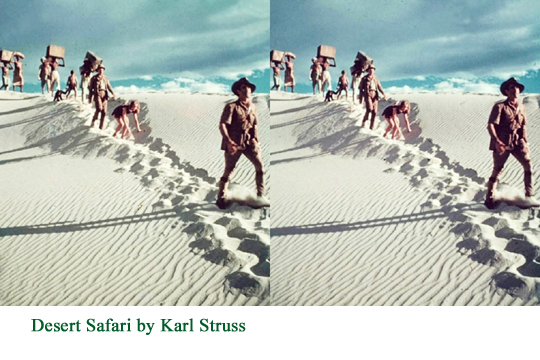 When the Stereo-Realist Camera came on the market in 1947, Struss was an early enthusiast and he became one of the first members of the Stereo Division of the PSA when it was formed in 1952. Struss was also a charter member of the PSA Stereo Club of Southern California in 1956 at which time he served on the Program Committee. 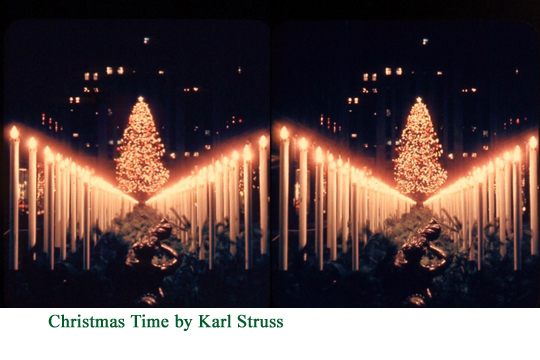 The veteran stereo photographer was active in many PSA, SCSC, S4C and other international stereo slide competitions until 1965. 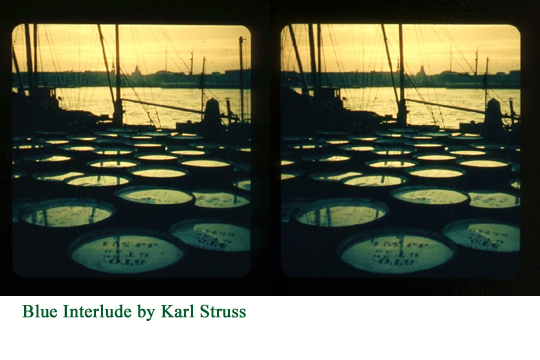 Struss garnered many acceptances for his stereo slides in the PSA Hollywood International Salon and numerous Honorable Mentions (HM) in PSA International Exhibitions. In the 1965 Rochester International Stereo Salon, Struss garnered acceptances, for "Anthony and Cleopatra" and "Distant Bellagio" and an HM for "Varenna Moonlight." 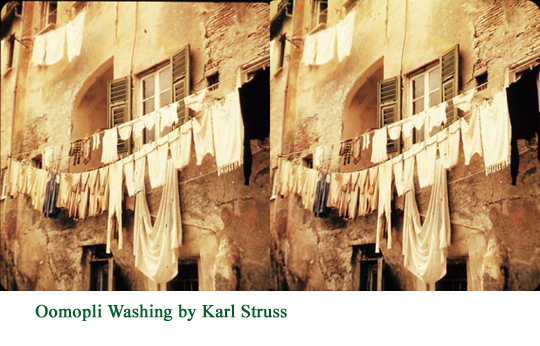 Struss had photographed these images with his Stereo-Realist camera while working on location in Italy in 1953 and 1954 as a director of photography on four feature films, three of which were in 3-D.
"I enjoyed working in Italy," said Struss. "the directors and I got along and I loved Rome and the people." Struss worked in Italy as a stereoscopic cinematographer on The Funniest Show on Earth (Il Piu Comico Spettacolo Del Mondo) and The Neapolitan Turk (Il Turco Napoletano), both directed by Mario Mattoli in 1953 in color and filmed with a dual 35mm system. Rustic Cavalry (Cavalleria Rusticana), was a black-and-white 3-D film starring Anthony Quinn and May Britt.. Sophia Loren had originally been cast in Rustic Cavalry but was replaced by Kerima shortly after filming began. 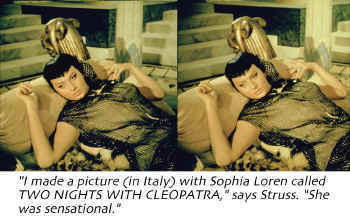 "I made a [2-D] picture with Sophia Loren called Two Nights With Cleopatra, (Due Notte Con Cleopatra)" said Struss. "Oh, the sets were beautiful, gorgeous, and she was sensational. But when they dubbed it into this flat English, all the atmosphere went out of it." Struss' stereo slide of "Anthony and Cleopatra" from the Rochester International Salon featured Sophia Loren in a behind-the-scenes shot that Struss had made while filming her in Italy. Of the three 3-D films Struss photographed in Italy, only Rustic Cavalry was released in the United States, but in 2-D. Before leaving for Italy in 1953, Struss had photographed for producer Sol Lesser in Hollywood with "Stereo Cine," a dual 35mm system, the first segment of a film called The 3-D Follies. R.M. Hayes in 3-D Movies (McFarland: 1989) calls this film "one of the great mysteries of 3-D history." 3-D Follies was apparently filmed at the RKO Studios in Eastman Color and featured an array of performers that included Milton Berle and Lili St. Cyr. 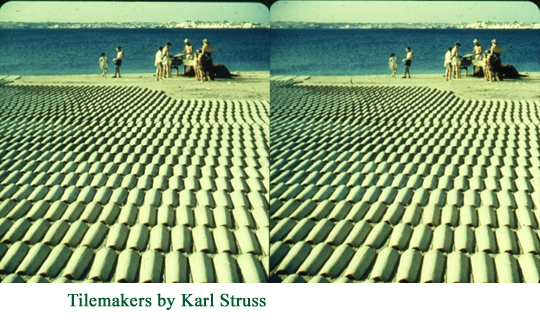 There are several important questions that historians of Struss' work and stereoscopic cinema will ask. Was The 3-D Follies actually completed and released? 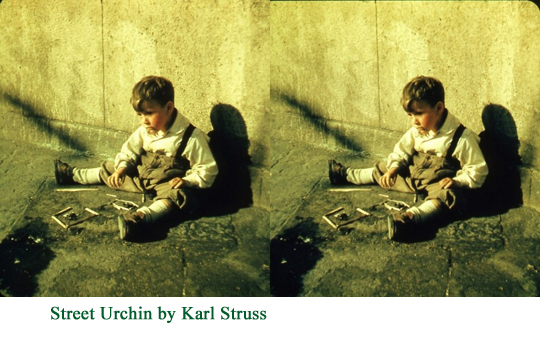 Do the stereoscopic elements for Struss' three Italian feature films in 3-D still survive? And, most importantly, where are these films today? "I never got bored," said Karl Struss. "Never wanted to photograph something differently after I'd done it." 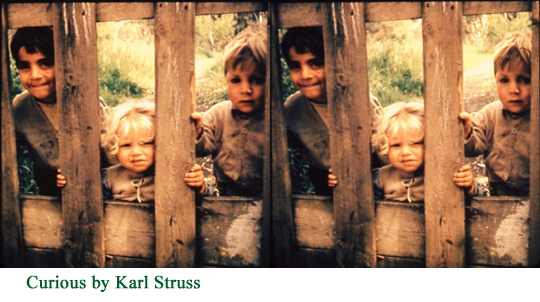 Struss passed away on December 16, 1981. "Photography was the ne plus ultra of Struss' life," writes Scott Eyman. "Whether it was the pictorial stills in which he began, cinematography, or the 3-D photography that was consuming him towards the end of his life, the challenge for Struss was always to express a mood, to tell a story through his camera, to find in nature what expressed the emotions of man."